Los Angeles and more, before wrapping in Boston, MA on October 10. See below for J. Cole's full itinerary. 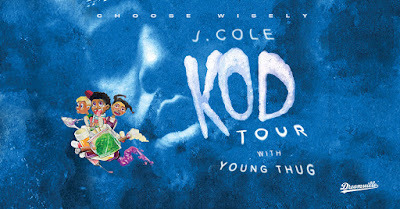 Released via Dreamville with distribution through Roc Nation /Interscope Records, KOD arrived on April 20 and debuted at #1 on the Billboard 200, marking J. Cole's fifth consecutive #1 on the chart. Along with scoring the biggest streaming week for an album so far in 2018, KOD has earned the third-biggest streaming week for an album in all of chart history. The tour will be a can't miss outing for fans of the highly praised and much discussed album. In addition, there will be a Spotify pre-sale beginning Friday, May 11 at 10 a.m.local time and continuing through 10 p.m. that day. The fifth studio album from J. Cole, KOD follows his critically acclaimed, platinum-selling 2016 album 4 Your Eyez Only. In the week ending April 26, KOD sold 397kequivalent album units, while its songs amassed 322 million audio streams. That makes J. Cole only the third artist in history to surpass 300 million audio streams in its debut week—an achievement that's especially remarkable considering that KOD only contains 12 songs. A North Carolina native, J. Cole was the first artist signed to Jay-Z's Roc Nation label, which released his official debut Cole World: The Sideline Story in 2011. To date, he's received five Grammy Award nominations, including Best New Artist and Best Rap Album (for 2014's 2014 Forest Hills Drive). Arriving in December 2016, 4 Your Eyez Only debuted at #1 on the Billboard 200 and gained acclaim from outlets like the New York Times(who praised it as "spartan but sumptuous, emotionally acute but plain-spoken…one of the year's most finely drawn [albums]"). 4 Your Eyez Only was J. Cole's first release for Dreamville, the label he launched in 2007. Like all of J. Cole's first four albums, it's certified platinum. Young Thug is a rapper and fashion icon who defies borders. He has close to 11 million monthly listeners on Spotify and his projects are critically acclaimed (4 received scores of 8 or higher on Pitchfork). Thug recently released his mixtape Super Slimy with Future and scored his first Billboard No. 1 on Camila Cabello's 'Havana'.